SAGA's push to the east, beginning with the Byzantines and Rus in Varjazi & Basilieus has pushed further into Asia with the release of the new Steppe Tribes board in Wargames Illustrated 311. It is a welcome move, for it is a time period and location in which I have a a great deal of interest and background. 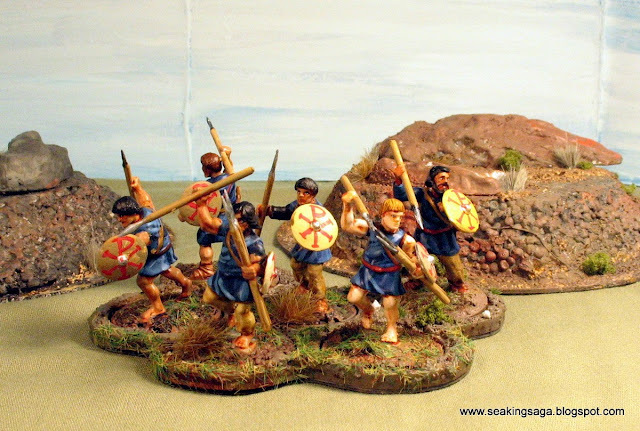 As I have been putting together levies for SAGA and Hail Caesar lately, my expectation is that cheap (low quality) troops need to be acquired cheaply (low cost). While there is no perfect, dedicated solution for plastic Eastern European and Central Asia armies in the Dark Ages, there are some acceptable substitutes. A Byzantine Army was one of the first historical armies I began putting almost ten years ago. Most of my psiloi were archers and a few slingers from Crusader and Gripping Beast, but no javelin-bearers, as SAGA specifies. 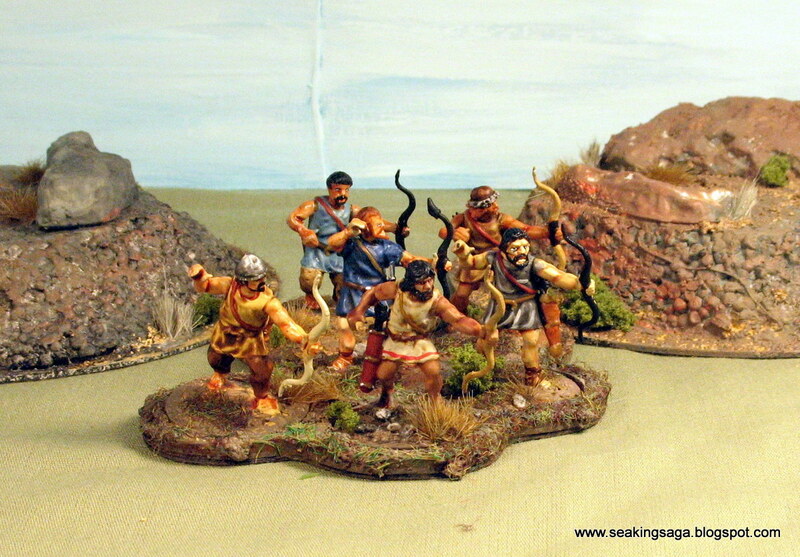 Below is a half-unit of Byzantine skirmishers put together from Wargames Factory Numidian bodies, Saxon and German heads as well as a couple of Gripping Beast plastic unarmored heads. As with any mod, it is a bit of a compromise. Byzantine troops with standardized tunics and shields would probably have had better footwear and trousers, but I think it works well enough for a game. Steppe tribes used slaves, captured enemies and even women and children as foot skirmishers. A favorite tactic of the Khitans and Mongols would be to drive captured enemies towards their own city's walls to create confusion and hesitation among the besieged. 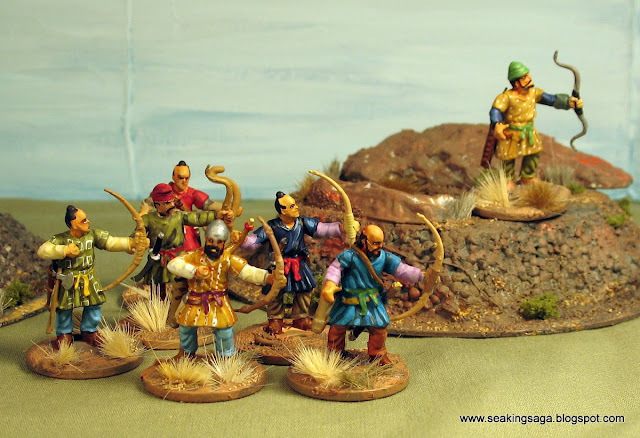 With that in mind, these steppe skirmishers were meant to be a diverse and poorly clad lot that could have come from anywhere between Kievan Rus and Mongolia. Again, the bodies are Wargames Factory Numidians and Gripping Beast heads. More brightly adorned and better equipped are the archers pictured below. They were intended to look like city militia or merchant guards for the Silk Road cities, such as Samarkand or Bukhara. These bodies are from Wargames Factory's Persians along with various German and Viking heads. 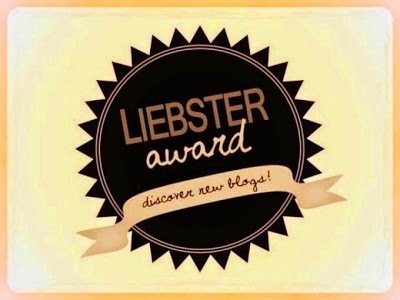 Thanks for stopping by, and my next post will be some historical fiction recommendations for Byzantium and steppe tribes before the Mongols. Some interesting kit bashing, the wargames factory stuff can be very useful!